What technology is being used to aggregate open educational resources? What role can the subject community play in resources discovery? This is a post in the UKOER 2 technical synthesis series. In the UKOER 2 programme Strand C funded “Projects identifying, collecting and promoting collections of OER and other material around a common theme” with the aim “…to investigate how thematic and subject area presentation of OER material can make resources more discoverable by those working in these areas” (UKOER 2 call document). The projects had to create what were termed static and dynamic collections of OER. The intent of the static collection was that it could in some way act as an identity, focus, or seed for the dynamic collection. Six projects were funded: CSAP OER, Oerbital, DelOREs, Triton, EALCFO, Open Fieldwork and a range of approaches and technologies was taken to making both static and dynamic collections. The projects are all worth reading about in more detail – however, in this context there are two possible general patterns worth considering. 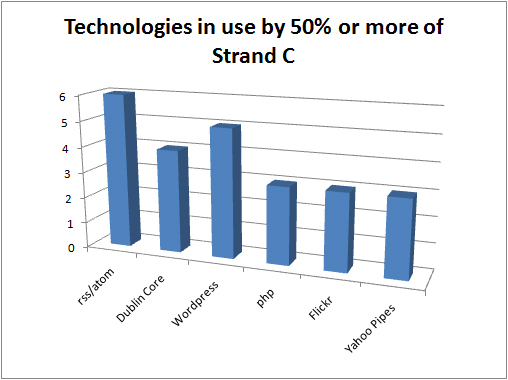 The above graph shows the range of technology used in the Strand. Although a lot could (and should) be said about each project individually when their choices are viewed in aggregate the following technologies are seeing the widest use. reflection: is this indicative of how many content providers and aggregators in the learning material’s consume or output OAI-PMH? One of the critical issues for all of these projects in the creation of these collections has been the role of community; for some of the strand projects the subject community played a crucial role in developing the static collection which then fed, framed, or seeded the dynamic collection, for other projects the subject community formed the basis of contributing resources to the dynamic collection. Although the projects had to be “closely aligned with relevant subject or thematic networks – for example Academy Subject Centres, professional bodies and national subject associations” , I find it striking that many of the projects made those defined communities an integral part of their discovery process and not just an audience or defining domain. I’m hoping someone else is able to explore the role of community in discovery services more fully (if not I’ll try to come back to this) but I’ve been struck by the model used by some projects in which a community platform is the hook leading to resource discovery. It’s the opposite end of the spectrum to Google – to support discovery you create a place and content accessible and relevant to a specific subject domain. The place you create both hosts new content created by a specific community and serves as a starting point to point to further resources elsewhere (whether those pointers are links, learning pathways, or tweaked plugin searches run on aggregators or repositories). This pattern mirrors any number of thriving community sites (typically?) outside of academia that happily coexist in Google’s world providing specialist sources of information and community portals (for example about knitting, cooking, boardgames). What standards did projects intend to use to describe and package their OERs? – what other standards are in use? This is a post in the UKOER 2 technical synthesis series. As noted in commenting on the first UKOER programme, many projects will be using Dublin Core because it is probably the most commonly implemented interoperability standard in repositories and is also a required part of the OAI-PMH protocol. It is, however, noteworthy that some of the projects are developing a wordpress plugin to support the creation of DC metadata based on items in blog posts rather than the blog post itself (for more details please refer to the Summary of Strand C [forthcoming]) . The use of IEEE LOM in the second programme is quite a bit lower than in the first UKOER programme. 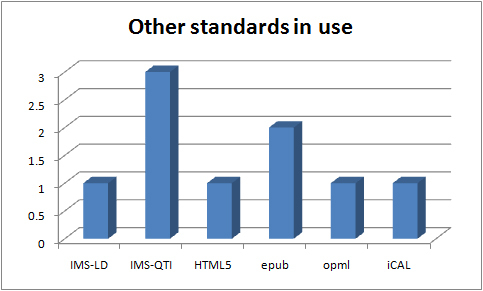 Two possible reasons for this are: 1) fewer projects are using learning object repositories so there is less native support for LOM 2) in the first programme a number of HEA subject centres may have had significant quantities of existing content in the LOM which they released under an open licence, in the second programme projects may not have had relevant legacy content in this form. [Note: these are speculative]. Exif is a standard widely used in cameras and smartphones for storing and transferring information about images, audio, and associated tags. More information is available in the Wikipedia article. In use by the Open Fieldwork and ORBEE projects. MeSH (Medical Subject Headings ) is not a descriptive metadata standard as such but it is rather a controlled vocabulary used in the description of medical resources. It can be used and referenced with a number of metadata standards such as Dublin Core and IEEE LOM. In use by the PORSCHE project. “geo (pronounced “gee-oh”) is a simple format for marking up WGS84 geographic coordinates (latitude; longitude), suitable for embedding in HTML or XHTML, Atom, RSS, and arbitrary XML. geo is a 1:1 representation of the “geo” property in the vCard standard (RFC2426) in HTML, one of several open microformat” from http://microformats.org/wiki/geo. In use by the Open Fieldwork project. Keyhole Markup Language: “KML is an XML language focused on geographic visualization, including annotation of maps and images. Geographic visualization includes not only the presentation of graphical data on the globe, but also the control of the user’s navigation in the sense of where to go and where to look.” The major implementation of this standard is in Google Earth and Google Maps. Paradata is a rapidly evolving specification to describe activity and review data for digital assets. The initial specification was developed by the NSDL) in connection with the US Learning Registry initiative. In conjunction with SRI International the Oerbital project developed an experimental template to generate paradata from mediaiwki pages at the OER Hackday. 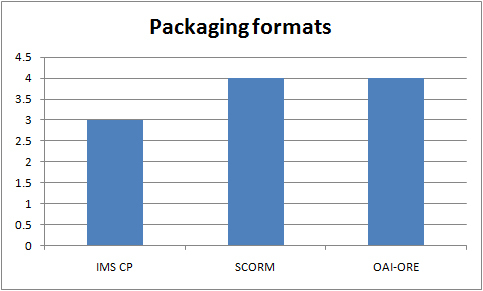 Two projects are using both IMS Content Packaging and ADL SCORM – EALFCO and ALTO. ALTO’s use may relate to the capabilities of the tools they have chosen to use. OAI-ORE – a number of projects mentioned this standard. For three of the four projects the standard is supported out of the box by the repository platform they were using and it is there is no indication of actual or intended use. Part of the OSTRICH project team (the partners at University of Bath) were investigating the possible use of OAI-ORE with their repository. The other standards graph is a miscellanea of other standards which projects are using which are distinctive but don’t easily fit into other categories. IMS QTI, one of the content types whose release surprised us in the first UKOER programme, has again been released by a number of projects (De-Stress, OER Cafe, Ripple). HTML5 is a work in progress of the latest update to HTML the defining specification of the world wide web. The De-Stress project used this specification. Although mobile delivery and etextbooks were not an explicit part of the call both DHOER and Triton are experimenting with the epub format to explore these options. OPML (Outline Processor Markup Language) http://www.opml.org/spec is being used in the progamme by the Triton project to support exchanging lists of RSS feeds. the iCalendar specification is an exchange format for calendar information which can be used to record diary information or request meetings. The EALFCO project was investigating the use of this specification. 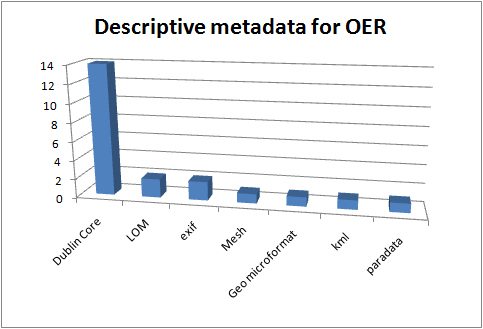 The Dublin Core Metadata Initiative “popularized the idea of “core metadata” for simple and generic resource descriptions” and its initial 15 descriptive elements became an international standard and a component of the Open Archives Initiatives Protocol for Metadata Harvesting. The Dublin Core community has subsequently developed in two directions – one developing application profiles to support particular implementation communities and the other developing in a way that would make its data structures more compatible with RDF and support the uptake of Dublin Core around Linked Data (http://dublincore.org/metadata-basics/). At this time there is, therefore, a very wide spectrum of usage of Dublin Core. Projects will be creating Dublin Core metadata as a side effect of their deposit into JorumOpen – but this isn’t a choice to use DC in the programme as such. I think there is a definite tension between the ongoing use of OAI-DC as part of OAI-PMH and the uptake and use of DC Terms. This overview of the use of does not comment on the element / term choices used as part of the use of Dublin Core.